Bladensburg received a $44,000 EECBG grant from the MEA, which it used for energy efficiency upgrades. 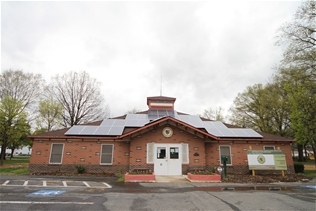 Bladensburg‘s visitor center and its police department are now more energy efficient and comfortable. Thanks to the Maryland Energy Administration (MEA) and theDepartment of Energy’s (DOE) Energy Efficiency and Conservation Block Grant (EECBG) program, both visitors and staff of those buildings are helping Maryland reach the EmPOWER Maryland goal of reducing energy consumption 15% by 2015. Bladensburg received a $44,000 EECBG grant from the MEA, which it used for energy efficiency upgrades. The grant enabled the town to purchase two new ENERGY STARrooftop heating and air conditioning units, and one new ENERGY STAR gas furnace. These upgrades are estimated to reduce Bladensburg’s annual electricity consumption by almost 15 MWh, and reduce its annual natural gas consumption by more than 1000 therms. This amounts to an annual savings of approximately $3,400. By replacing the three older units, Bladensburg will also avoid future maintenance and replacement costs. Bladensburg has taken giants strides toward energy efficiency. In addition to the heating and cooling installations, the town has also engaged additional energy efficiency measures, such as installing 19 kW solar photovoltaic (PV) system, new sealed entranced doors, and sealed replacement windows. Under the EECBG program, the 10 largest Maryland counties and the 10 largest Maryland municipalities (based on population) received grants directly from the DOE. MEA manages approximately $9.6 million in the State’s remaining EECBG funds, which the agency uses for projects in the remaining counties and municipalities. Bladensburg is the second MEA EECBG project to be completed.